To do: Have your teacher’s sign the permission form and return it to Ms. J. The deadline for permission forms is December 12, 2014. AND – make sure all of your missed classes are made up by January 15th at noon. When: Thursday, December 18, 2014 – 5:45 – 8:00 – students arrive at 5:45, doors open at 6:15, and show starts at 6:30pm. What: Performances by all Surrey secondary schools involved with dance. Block 3 and 4 Dance classes will be performing. To do: Parents fill in and sign, have teachers sign, and students return the permission form for this field trip. Deadline for permission form is January 7, 2015. 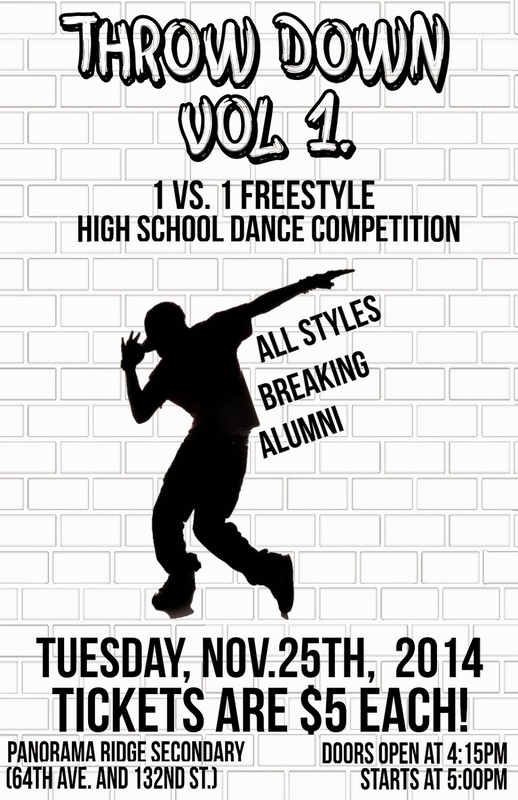 Tickets: $10 from Ms. J in the dance office. We only have ten tickets per school. This event will sell out. Get your tickets as soon as they become available. To do: If you are performing make sure you have a ride to Fleetwood Park. When: Saturday, January 17, 2015 registration starts at 9:30am. Ms. J will let you know Frank Hurt’s registration time as soon as she knows it. Doors open to the public at 12:30 and the show starts at 1:15. It usually runs all day till around 5! If your dancer needs to leave early just let me know. YouTube: Block 3 - Kevin's American Boy - Finished! This was an amazing field trip!! Thank-you for participating and learning more about our local dance world outside of Frank Hurt. YouTube: Jessica's Fallin' - 7 people missing - better learn the choreo! !